The worst thing you can do when playing daily fantasy football during the postseason is to assume it’s like playing during the regular season. It’s not. The game slate is much shorter. There are normally at least 10 games happening during each week in the regular season. By contrast, there are only a few games each week during the NFL playoffs. That means there are fewer available players you can use to create your lineups. That, in turn, means there’s going to be a substantial amount of overlap between your lineups and those created by your competition. That’s a key aspect of playing fantasy football in the postseason. It changes everything. With that in mind, we’re going to cover several rules of engagement for competing in – and winning – fantasy football contests during the NFL playoffs. To fully appreciate the extent to which overlap between your rosters and your opponents’ rosters impacts your chances of cashing, it’s helpful to recall the effects of variance. At its simplest, variance is a measure of scoring consistency. It reflects the predictability of each player’s production. There tends to be a high level of variance in fantasy football. That variance, while often frustrating, is an important part of drafting winning lineups. A breakout performance on the part of one or more players can dramatically improve your chances of finishing in the top of the field. That’s partly due to the wide selection of players available during the regular season. With 20 to 30 teams playing each week, there’s usually less overlap between rosters. Top-tier quarterbacks and wide receivers will, of course, be owned by a significant percentage of team owners. But aside from a small list of studs, there’s usually a lot of variability between lineups. With fewer teams playing, there are fewer players available to draft. That means each player will be owned by a greater percentage of the field. While variance (i.e. scoring consistency) for each player will remain unchanged, its effect across the field will be diluted. Breakout performances will be reflected in the scores of a greater percentage of the field due to a greater degree of overlap. In light of the above, you should be thinking of ways to create unique lineups that give you more upside potential than your competitors. We’ll talk more about doing that in a few moments. First, let’s cover Vegas odds, specifically with respect to fantasy football during the NFL playoffs. Vegas odds are one of the most valuable resources you have at your disposal. That’s true during the regular season as well as in the postseason. The over/unders and lines for all of the games in a contest reveal key insights into which teams are expected to win along with their expected margins. Those details can help you maximize your lineup’s production. Consider the projected scores for two teams in a matchup. The scores indicate whether a game is expected to be a high-scoring shootout or a one-sided beating. In the case of a shootout, you can expect to see the starting offensive players getting a lot of time on the field. You’ll also see the QBs relying heavily on their pass-catchers. In the case of a beating, you can expect the leading team to pull its starters sometime during the second half, limiting their production. You might also see its QB working with his running backs rather than his receivers. Remember, due to the high degree of player overlap, you have fewer opportunities to rocket past your competition in the postseason. That being the case, you need to leverage every possible information source. Check the over/unders and spreads posted by Vegas oddsmakers before creating your lineups. To Stack Or Not To Stack: Is Stacking A Smart Play? Stacking is a highly-effective strategy for daily fantasy football during the regular season. By pairing a QB and his top receiver, you can benefit from passing TDs on two fronts: you earn points from the quarterback’s TD pass and you also earn points from the receiver’s catch. But a QB/WR stack is far from a “surefire” strategy during the postseason. There are two reasons. First, stacking increases player overlap between rosters. With fewer players available to draft due to the shorter game slate, more team owners are likely to roster the same stack. If you draft the same QB/WR as your opponents, your lineup will lack the uniqueness you need to spring ahead of the pack. Second, stacking limits your opportunities to roster players who might have a breakout night. A breakout performance in the postseason can mean the difference between ending up in the top 10% of the field and joining the other 90% in a loss. Rather than stacking like everyone else, save key slots for promising players other teams owners miss. Having said the above, there is one way to stack during the playoffs that can give your lineup the uniqueness it needs to win: pair an elite QB with his top running back. Most team owners will rely on a QB/WR stack. But in a blowout, the QB is more likely to let his runners move the rock down the field than to attempt passes and risk interceptions. For even more advanced strategy, check out this great article focused on strategic adjustments you should make when playing at FanDuel vs DraftKings here. The key to making the strategy work is to identify predicted blowouts. You can do that by checking Las Vegas spreads. Home Vs. On The Road: How Big An Advantage Is Playing At Home? As you know, the home team enjoys an advantage over the visiting team. The former enjoys the support of its fans, which can spur the team to perform at a higher level. It also benefits from playing on a familiar field. But how significant is the home field advantage? In their book “Scorecasting: The Hidden Influences Behind How Sports Are Played and Games Are Won,” Jon Wertheim and Tobias J. Moskowitz noted that NFL teams won more than 57% of their home games. That’s significant given that you need to exploit every possible edge in the postseason. How can you use this tip to your advantage in daily fantasy football during the postseason? First, identify matchups that have razor-thin spreads. Then, roster players from the home team – for example, a QB/RB stack – that might have a breakout night. With few other owners using this approach, you’ll have an opportunity to catapult ahead of them. It’s no surprise that weather can have a huge impact on a game. High winds will make even the most confident quarterback unwilling to attempt long passes. That means his receivers will have fewer opportunities to produce points; he’ll rely more heavily on his running backs and tight ends. Along the same lines, heavy rains can drastically reduce visibility. That too will make a QB less inclined to try long passes. His running backs and tight ends are bound to see more action. Draft offensive players who are most likely to handle the ball according to the weather conditions expected during a game. For rain and snow, focus on the running backs and tight ends. If weather reports show plenty of sunshine, focus on the wide receivers. Another useful tactic is to roster an effective defense that’s expected to play in poor weather. Defense is often dismissed as unimportant in terms of production in daily fantasy. But keep in mind that rain and snow make the offense’s job more difficult. A good defense will take the opportunity to effect turnovers. Be sure to check the weather reports for this weekend’s games, if only because your competition is likely to neglect them. Inclement weather can give you a huge advantage. 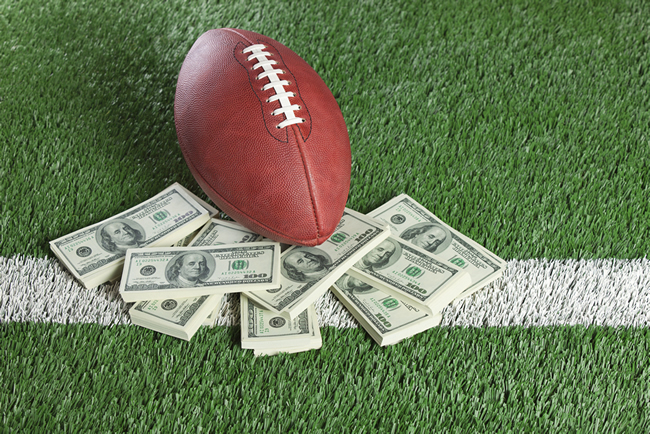 In past fantasy football articles, we’ve talked about ways to maximize your budget. For example, finding a few high-value, low-salary players gives you more flexibility to pick up high-salary studs who will produce. But being thrifty doesn’t pay to the same extent during the NFL playoffs. Remember, there’s a much smaller list of available players. Your choices are limited. While saving money on one player gives you more cash to spend on another, there are fewer big-value plays to take advantage of. That’s not to suggest the concept of value is irrelevant in postseason fantasy football contests. Rather, it’s just less important than it is during the regular season. Creating unique lineups filled with productive players your competition has overlooked should have a higher priority. Here’s the takeaway: fantasy football during the NFL playoffs is a different animal than fantasy football during the regular season. The shorter game slate introduces unique challenges. The good news is that you now have a few tips and tricks that will give you an edge over other team owners. As the 2014-2015 NFL postseason heads into the Super Bowl, use them to win real cash prizes at FanDuel and DraftKings!